These fun designs are captured in printed felt for holiday projects and decorations. Whimsical holiday ornaments, funny snowmen, and penguins accent this holiday felt pack. Designs feature layered and stitched felt appliqués for decorating home décor items or fashion. These accents are ready to accent jeans, your favorite tote, or lamp shade. A whimsical collection of pre-stitched holiday characters that are ready to decorate boxes and other surfaces. They are great for decorations or projects for family and friends. 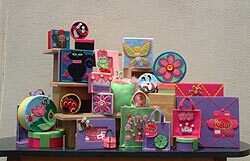 This is a collection of bright colored felt projects for the Spring and Summer months. 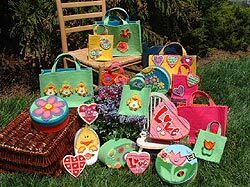 These fun totes, covered boxes, and appliqués feature bright flowers, eggs, and chicks for your enjoyment or gifts for your friends.